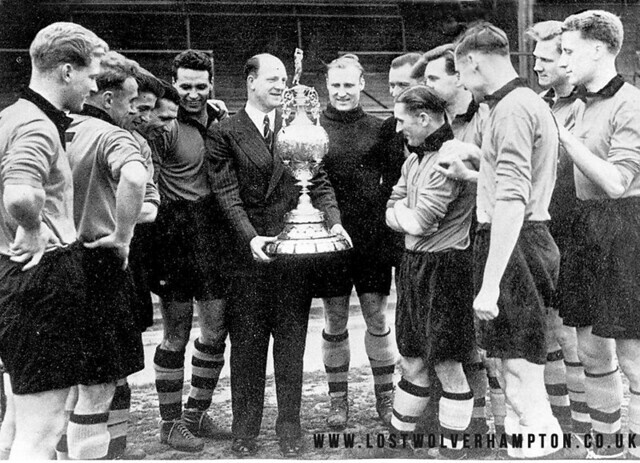 Frontpage › Forum › People & Places of Wolverhampton › WANDERERS' FOREVER! This topic contains 2 replies, has 2 voices, and was last updated by Billy 4 years, 3 months ago. Bob Tame our latest member easily solved this weeks quiz question So I posted this historic Wolves picture to compliment Bobs answer. We wont mention the Baggies at this stage. Dad and his brothers used to take me there at put me on the benches at the bottom of the North bank so I could see over the wall They stood on the terrace behind me to keep an eye on me. I saw everything from pitch level. When I was a bit bigger I sometimes went in the boys enclosure at the corner of the North Bank. I probably saw the best seven years in Wolves History from 1954 to 1961. Carried on watching them until I discovered girls in the mid 60’s. Still waiting for those great days to return. I met my wife on a night out when we were drowning our sorrows at the Woolpack after Wolves lost 2-1 at Home to Coventry on Jan 29th 1966.